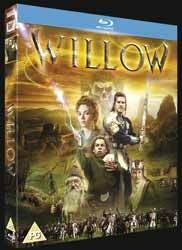 Willow (1988 - 2 hr, 05 min, 55 sec) is a sci-fi action adventure family film directed by Ron Howard. It was the brain child of George Lucas and, like Star Wars, follows the well worn monomyth (the hero's journey) as laid out by Joseph Campbell. Here young Willow (Warwick Davis), a simple farmer from a dwarf-like race called Nelwyns, finds a Daikini ("large people") baby. Willow volunteers to return the baby girl to the edges of Daikini territory - hoping that they will be able to find her real mother. However, when he discovers that the baby girl is being hidden from the evil queen (Jean Marsh), who will kill it the infant if she finds her, Willow vows to stay with her until she can be delivered to safety. Along the way Willow encounters the rogue warrior Madmartigan (Val Kilmer) who promises to help Willow if he will free him from his prison, along with Rool and Franjean (Kevin Pollak and Rick Overton), two tiny brownies who act as comedy relief. But the queen's army, led by her warrior daughter Sorsha (Joanne Whalley) and General Kael (Pat Roach) are not far behind. Extras include Willow: Deleted Scenes with Ron Howard (12 min, 32 sec look at some missing scenes and story arcs which had to be cut from the final film due to timing issues); The Making of an Adventure with Ron Howard (23 min, 29 sec behind the scenes featurette); From Morf to Morphing with Dennis Muren (17 min, 24 sec look at the morphing technology which was pioneered in this movie, with Dennis Muren who headed up the special visual effects); Willow: An Unlikely Hero - Personal Video Diary of Warwick Davis (10 min, 53 sec featurette which sees Davis being interviewed recently about his memories of the film. It also includes some of his home video footage that he took behind the scenes); and Matte Paintings (1 min, 09 sec look at some of the matte painting landscapes used in the film). The only slight grumble I have is that Warwick Davis's interesting audio commentary, which was included on the 2002 DVD release, is absent. It's amazing how well this movie still hold up today. Sure some of the effects look a little dated and the acting isn't always what it could be, but this is still a great family movie that will no doubt find a new generation of fans thanks to the great quality of this Blu-ray release.